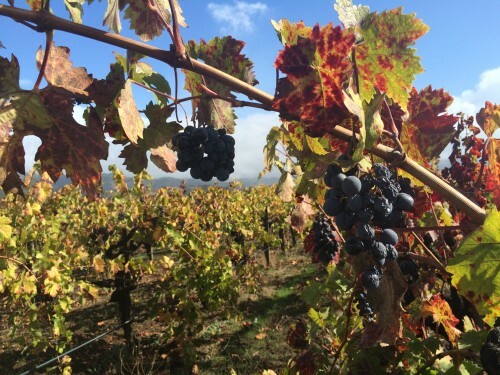 to the positively … perfunctory? Anyway, whatever the (re)purpose, we love ’em! 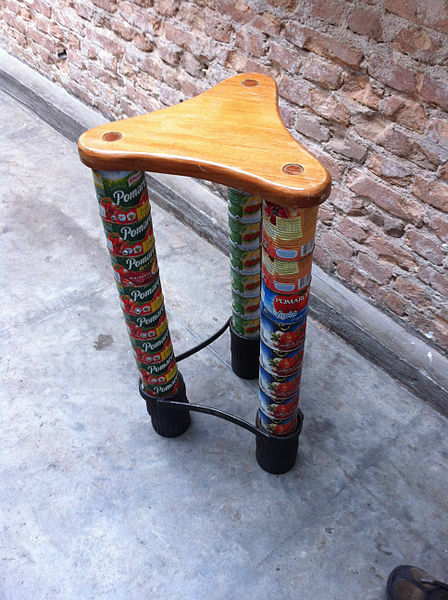 But you must admit that there’s something stupendously special (and infinitely inspiring) when someone elevates repurposing to the heights of entrepreneurial artistry—someone like Traci Claussen of REpurposingNOLA Piece by Peace. If you’re wondering who NOLA is, you’re probably not from the South (neither am I). NOLA, I learned, is the shiny new acronym for that legendary city that has risen from the floods of Katrina: New Orleans, Louisiana. 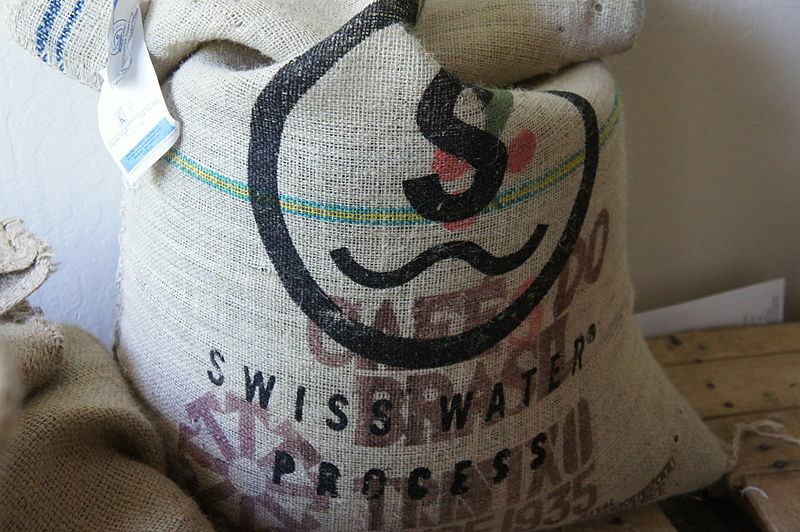 Traci started making bags from burlap coffee sacks and old carpet in 2009. 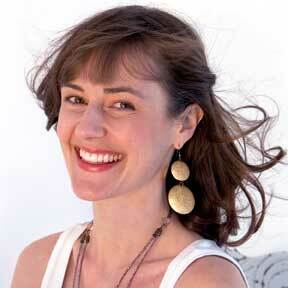 Now, Traci tailors her designs to meet the needs of her travel-savvy customers. She offers a BURLAP line, featuring her original three designs and seasonal favorites, as well as a signature CARPETBAGGER line and a VEGAN line of totes. 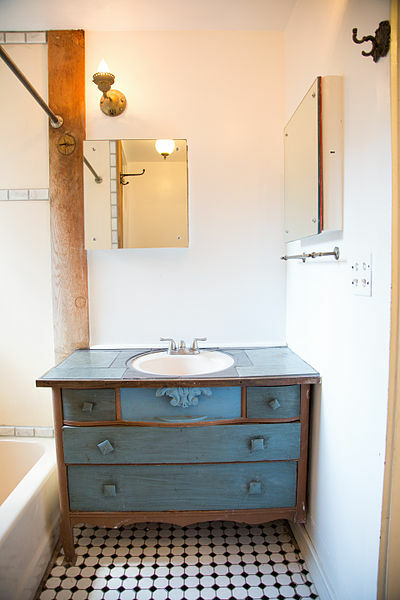 She also stocks her online store and physical shop at 604 Julia Street with gorgeous, eclectic goodies, including clothing, candles, and cosmetic collections—all locally made and mostly repurposed, of course. 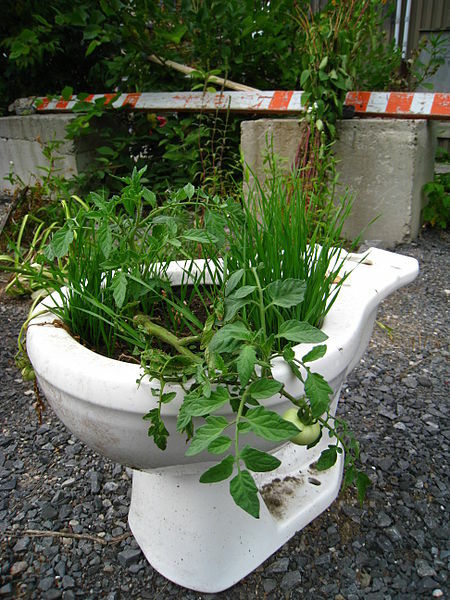 Hop on over to RepurposingNola.com to pick up a little more inspiration—and maybe even a Christmas gift or two! I know you love a good story as much as I do. But a good old-fashioned story? 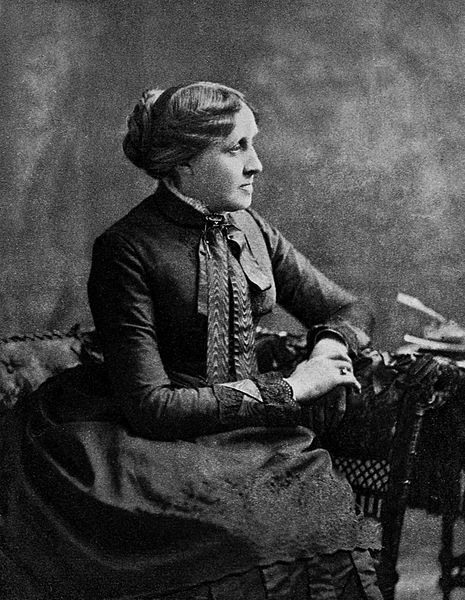 That’s right—Louis May Alcott (how thankful we are for her!) 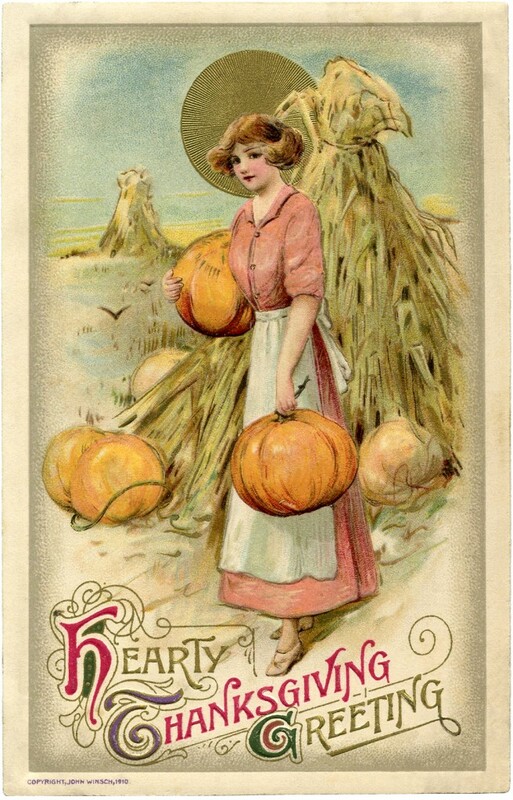 wrote a wonderful little account of the fictional Bassett family’s Thanksgiving in 19th century New Hampshire, aptly named, An Old-Fashioned Thanksgiving. Why are the children left to cook for themselves? It’s a bit of a mix-up, really, but I don’t want to spoil the story for you. Suffice it to say, a neighbor brings word that Grandma Bassett isn’t feeling well, so Ma and Pa must rush off to her aid by horse-drawn sleigh, leaving the children to prepare for Thanksgiving on their own. Oranges, gladful guests, and a delightful meal all manifest before the happy ending of the story (if that’s a spoiler, I do apologize). 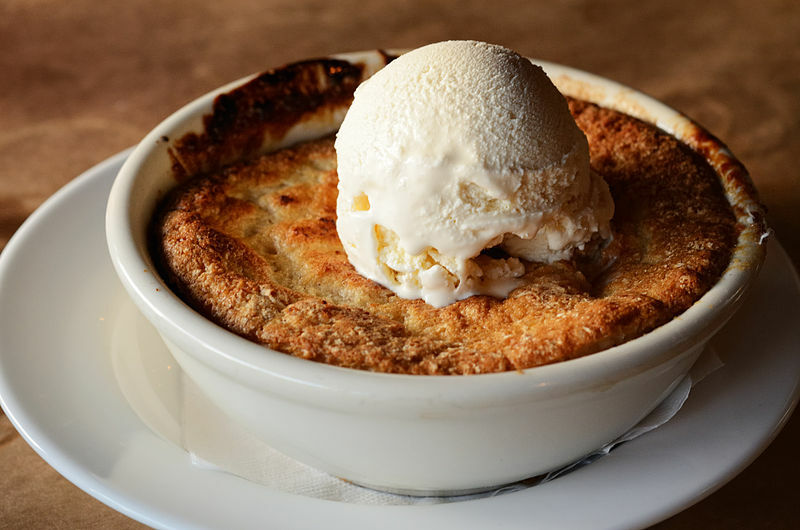 Tilly and Prue even manage to produce a perfect apple cobbler dessert, using the very recipe that is included at the end of the story: Louisa May Alcott’s Apple Slump. You want the recipe, won’t you? Well, just visit the Louisa May Alcott’s Orchard House website, where you can write down the recipe or order your own keepsake calligraphy copy for $2.50. • Read the full story online (for free) at Ibiblio.org. • Listen to the entire story (also for free) at Librivox.org. • Order a copy of one of the illustrated children’s book adaptations from Amazon.com. 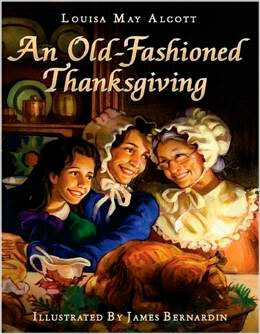 And, with that, I wish you a Thanksgiving full of joy, laughter, and delicious food shared with those you love. Many of us are fans of British television. Think Downton Abby, Sherlock, and the recent Dr. Who revival. 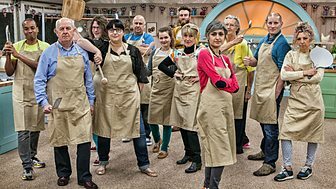 So I was intrigued to learn about Britain’s most popular show, The Great British Bake Off, a reality-based, amateur baking competition that’s quickly becoming a cultural phenomenon. 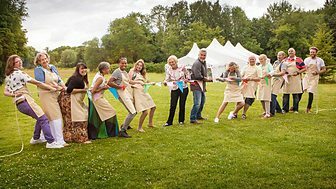 Now ending its fifth season, The Great British Bake Off displays none of the hallmarks of American reality television; the majority of the show is set inside tents filled with cooking stations, and the contestants themselves are regular people who just love baking and live in their own homes during the filming of the show. The biggest difference? There’s no prize money. So why do people love it? From what I can gather, the contestants’ lack of glamour makes them relatable to viewers. There are no ulterior motives, and because there’s no prize money, contestants aren’t sabotaging each other to get ahead. And the parts of a baking show you might think would be boring, like waiting for pastry to bake or bread to rise, actually end up building great suspense. I couldn’t agree more, and I hope our American television execs soon take a cue from our British friends across the pond. These darker, shorter days tend to veer my crafting to projects that might keep my hands happily busy for the winter months. Knitting and embroidery are hands-down my favorites. 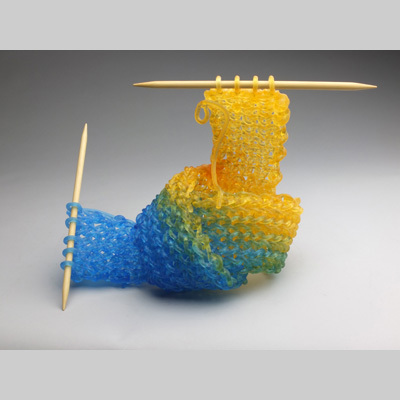 On a recent foray into cyberspace for some ideas, I happened upon Carol Milne, a Seattle-based artist from Canada who knits with glass. Yes, you heard that exactly right, she knits with glass! Milne has developed a technique for pouring glass into molds of designs made from wax, a new twist on the ancient art of lost wax casting. 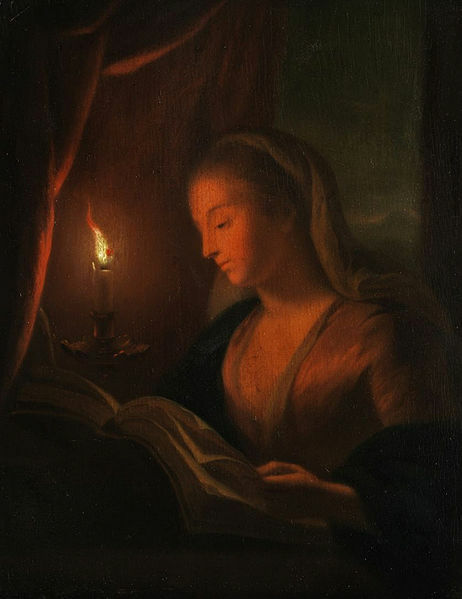 She uses a slender and very elastic candle to make different patterns, then surrounds them with a high-temperature plaster to make a mold. Each stitch of her knitted design must be carefully created by hand because using needles tends to stretch the wax. After the molds are dry, the wax is melted with hot steam and replaced by liquid glass. When the glass has slowly cooled, the molds are chiseled away in archeological fashion to reveal intricately knitted structures. Milne first embarked on this technically challenging journey back in 2002 as a way to couple her knitting passion (she’s been wielding needles since she was 10) with her love for cast glass sculpture. I think I’ll have to stick with yarn, but how inspiring to combine her two passions into timeless art. a milk bucket, that is. This year, hopefuls vying for the title of Miss Uganda had to show their talents in an unusual realm for a beauty pageant—a milking contest. 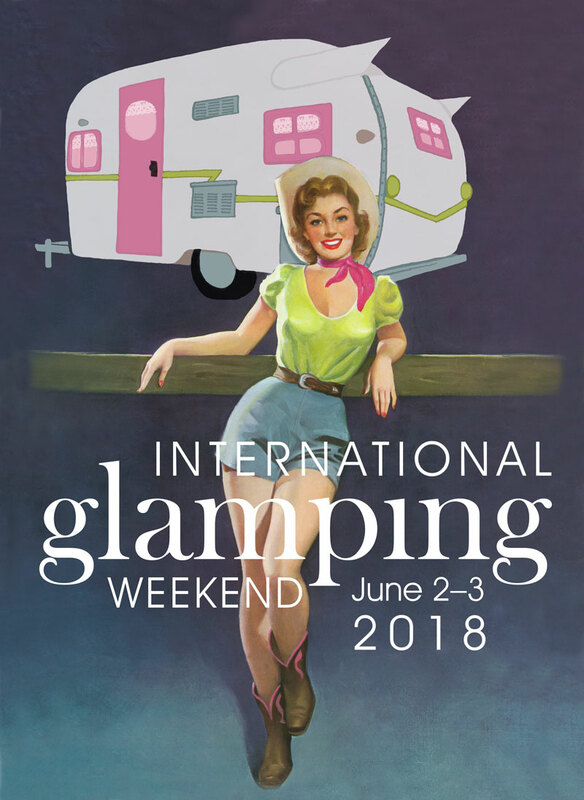 And that’s not all; they also had to handle sheep and goats and answer pertinent questions about agriculture—no tapping cup tricks for these ladies … and no swimsuits. “Why all this emphasis on farming?” you might ask. The current Ugandan president apparently thought it would be a good way to spotlight agriculture, the country’s economic backbone. 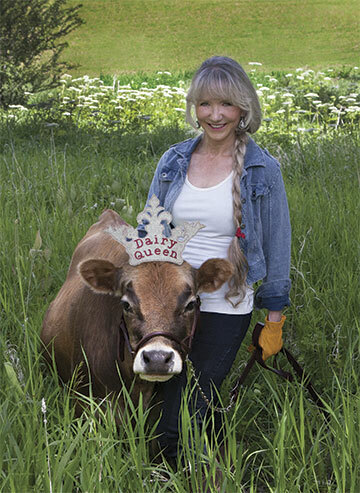 “We are here to change the perception that agriculture cannot co-exist with beauty. The contestants have been taken through 25 modules of agriculture and have had their hands dirty at some points to get to know how things are done. 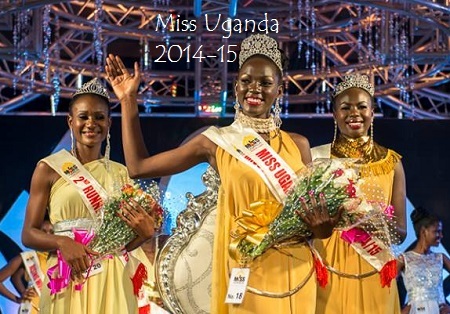 The regional winners, together with the overall winner, will champion agricultural projects in the next one year,” said Brenda Nanyonjo, Miss Uganda spokeswoman. If You Want My Opinion … Which I’m Sure You Don’t! Who says it? Can you name that character? 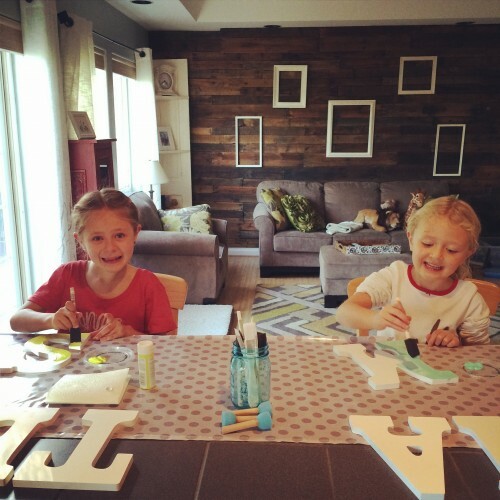 I’ve been hearing it from our bathroom while the girls brush their teeth, from the dining room while we eat dinner, hollered from the girls’ bedrooms, and muttered by the front entry while we pile our winter layers on. But who else says it? 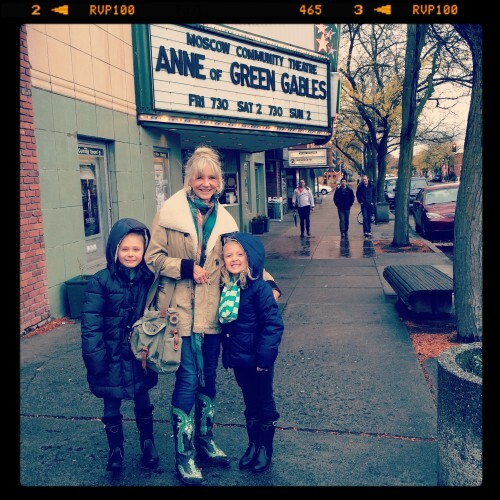 Nanny Jane took us girls to the theater last weekend to see a live performance of Anne of Green Gables. We are so lucky to have a great little theater with great little productions in our small town. It was definitely a cold and rainy November day. A perfect day spent with Anne Shirley and a bag of popcorn. 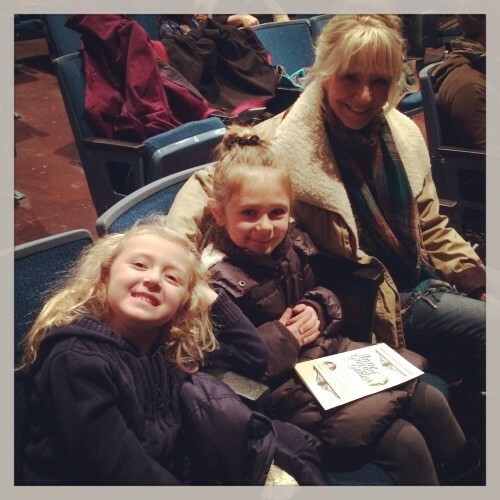 The cast was wonderful and catered to a younger crowd, so the girls loved it. The girls’ favorite line wasn’t one of Anne’s, but the rather nosy BFF to Marilla Cuthbert (Anne’s adopted Mum), Rachel Lynde. “If you want my opinion … which I am sure you don’t!” is a perfectly fitting thing for two sisters to tell each other pretty much … constantly. Hold on to your needles and yarn because science is proving what we farmgirls have known for generations … that crafting is good for the brain! Cooking, sewing, drawing, painting, taking photos, listening to music—any creative endeavor—is beneficial, and its physical effects are similar to those of meditation. When we’re involved with a craft, we enter a special zone that psychologists refer to as “flow”—that place where we are so focused on the task at hand that we don’t notice hunger or fatigue or the passing of time. 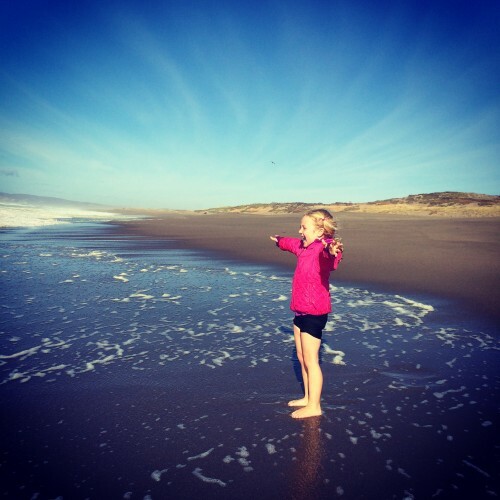 Being in a creative flow reduces stress and helps fight inflammation, and when we engage in activities that we find pleasurable, our bodies also release dopamine, nature’s own antidepressant. And just like playing brain games or working crossword puzzles, crafting can protect us against aging and dementia by working different areas of our brains at the same time, using memory, attention span, visual processing, and problem-solving in tandem. Whew, all that from a little old embroidery needle. So the next time you’re enjoying a little quilting instead of say, chasing dust bunnies, you can feel a little less guilty knowing you’re taking good care of your health. 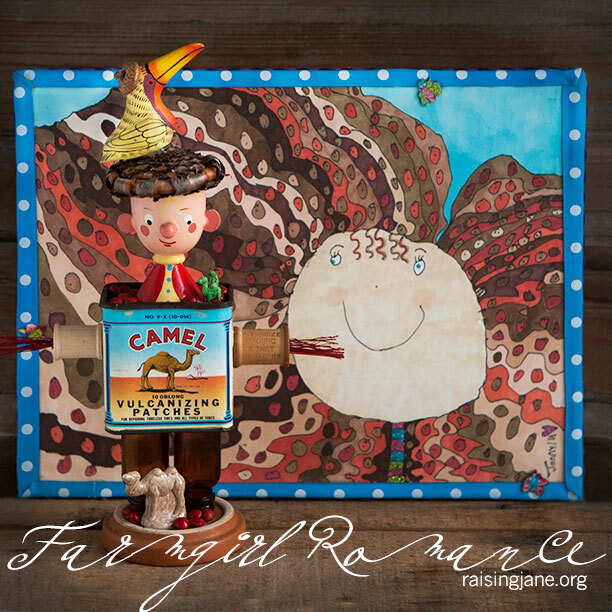 When Carol brought in her newest junk-sculpture creation, pictured above in our “Photo of the Day,” I was interested to see that, upon close inspection, the body of this little guy wasn’t a vintage Camel cigarette box, as you might think at first glance, but was, in fact, Camel Vulcanizing Patches. Say what??? Vulcanizing patches are something you might remember from your childhood, if you’re my age. We used them to fix our bike tires, and before that, our parents and grandparents used them to fix their car and tractor tires. But why does the box look like a Camel cigarette box, you might ask? The answer isn’t monkey business, but it DOES involve a monkey. In fact, a monkey was instrumental in inventing this inventive way of fixing a tire. “Tire repair, as we know it today, began soon after a pneumatic tire was mounted for the first time on a motor vehicle by Michelin in 1885. Between the hazards of sharp stones on dirt roads and discarded horseshoe nails, you were lucky to travel 100 miles without a flat tire. The only method of dealing with a flat tire at that time was to take out the tube and patch it. Permanent repairs could only be made by the time-consuming, and costly, hot vulcanization process. A temporary repair could be made by using a surface patch affixed by cold cure acid and the casing made serviceable by a “skied boot.” Neither method was satisfactory, and the only effective way of dealing with a tire failure, until about 1920, was the fitting of a new or replacement tire and tube. Specialist manufacturers of tire repair materials emerged following World War I. Some American companies had amusingly different claims about their origin, and one was written up in a 1920 issue of the Saturday Evening Post. It was about a man in Oklahoma City who, with his pet monkey, visited a friend’s bicycle repair shop. He placed the animal on a worktable while watching his friend repair a tire using the only known method at that time—a long, drawn-out process consisting of a liberal use of a sticky cement, a patch cut to size, and a long wait while it was vulcanized. During the visit, there was a loud crash of tools and cans—the monkey had overturned a large can of rubber cement, an acid container, and another solution. While trying to clean the mess from the monkey’s paws, the man found that when he rubbed his palm over the monkey’s paws, he warmed the cement and little rolls of material came off. But as soon as he finished, the monkey was able to knead the rolls into a ball, since the cement had set and was no longer sticky. Meanwhile, his friend became angry when he found the vulcanizer was not heating up properly and despaired at completing the tire repair. The man picked up some of the new rubber concoction, spread the gunk on the tire and asked his friend to try it, as it might cure without vulcanizing. After waiting several minutes, he pulled on the patch. It stuck. The tube was inflated and dunked under water. No bubbles. The men realized that they had developed a patch that would withstand the pressure of inflation and cured without heat. 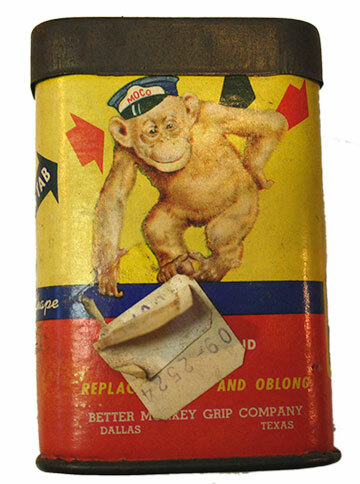 The patch was perfected and a few years later, Dallas-based “Monkey Grip” claimed to be the largest manufacturer of tire patches in the world. 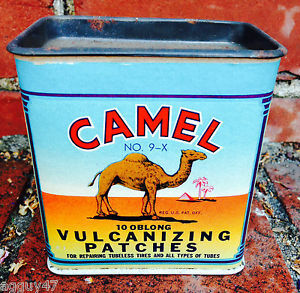 Now, that doesn’t sound to me like R.J. Reynolds Tobacco, who’s been making Camel cigarettes since 1913, was the manufacturer of Camel Vulcanizing Patches. 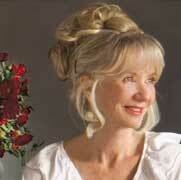 But the graphics on Carol’s can certainly evoke images of Camel cigarettes. 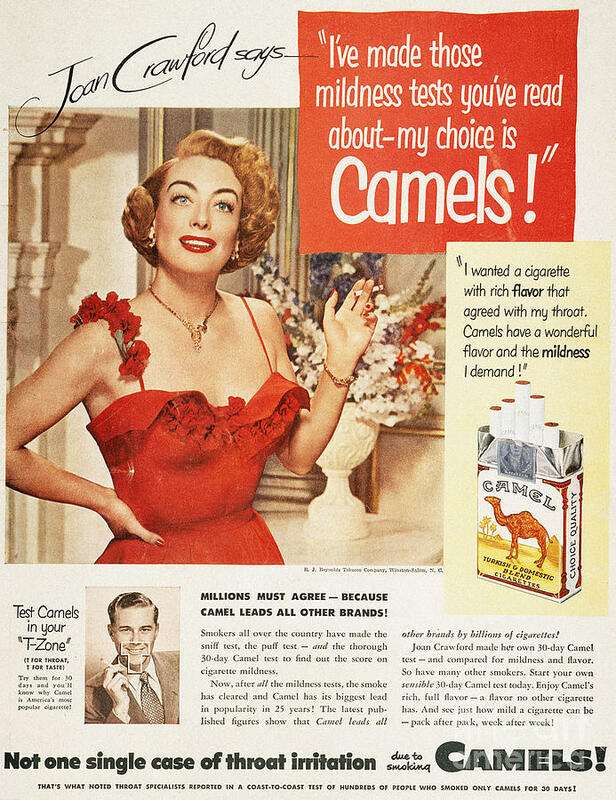 You can see from this old ad (note the “not one single case of throat irritation” claim) that the camel is facing the opposite way and the typestyle is slightly different, but the graphic, curved headline type, and subtitle placement are certainly similar enough to be confused. The patches were made by the H.B. Egan and Camel Tire Care Co. and the first can with the camel image was trademarked in 1925, well after the Camel cigarette graphic was in use. Was this a result of lax trademark laws in the early years? Or did R.J. Reynolds give the okay to use similar graphics since it promoted the use of Camel cigarettes to light up the vulcanizing process? My quick web search led to a dead-end, but if you like a good mystery and have a little time on your hands, it’s an interesting question for trademark history. And you might just find there’s monkey business involved. We did it! 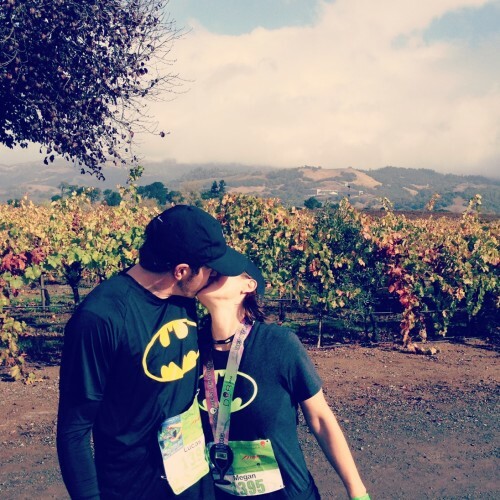 Hubby and I have been quietly training for another half marathon. In 2013, I completed my first half marathon. Becoming a runner has changed my life. It’s a form of meditation, a reminder to appreciate the body I have, to be thankful I am able to run. I certainly don’t do it quickly, but this allows me to enjoy the world around me. Of course, we were happy to abide by the suggestion to dress in costume. 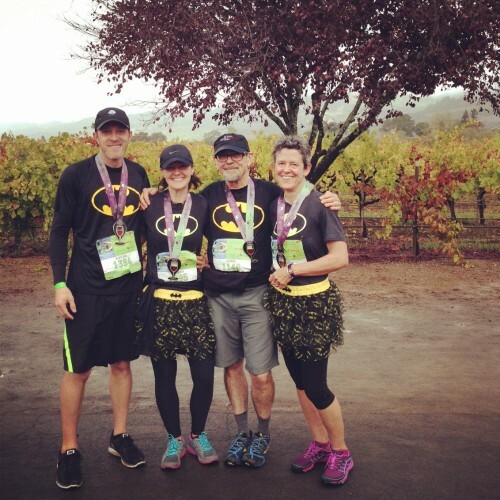 Hubby Lucas, myself, my dad, and my stepmom were maybe not as fast as Batman, but we sure enjoyed the journey! 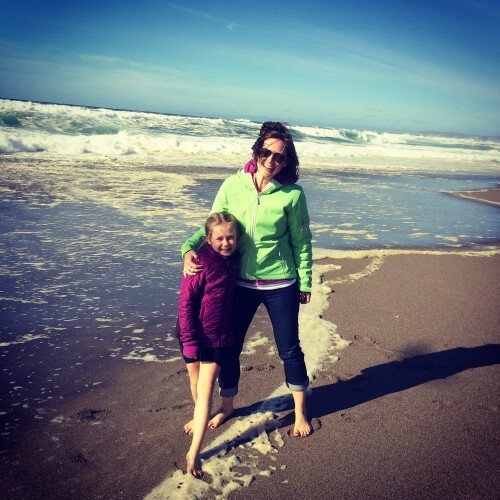 Our girls were there to cheer us on, and we finished the weekend with a jaunt over to Point Reyes National Seashore. It’s good for the soles of tired feet to soak in the salt water. And good for the soul to soak in the sounds of the ocean.